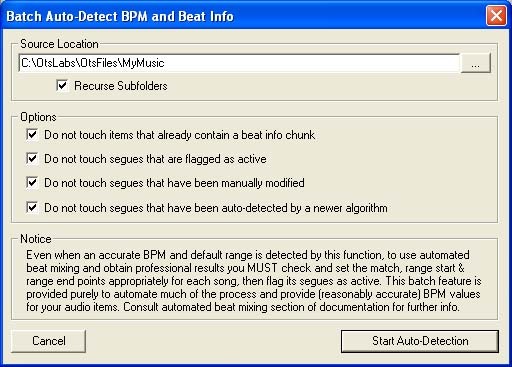 To add a Beat chunk to all of your Ots files, including Automatic BPM detection, you can instruct Ots Studio to do this task in a batch process. 1. Specify the parent folder containing your Ots files. Check the Recurse Subfolders checkbox if you have Ots files in subfolders. 2. Leave the Options checkboxes as is, unless you had previously created Beat chunks for your Ots files. If you have already created Beat chunks for your Ots files, the following options are available. Do not touch items that already contain a beat chunk: Any Items that already contain a Beat chunk will not be re-processed. Do not touch segues that are flagged as active: Any Intro or Outro Ranges flagged as Active, will not be re-processed. Do not touch segues that have been manually modified: Any Intro or Outro Ranges that have been manually modified will not be re-processed. Do not touch segues that have been auto-detected by a newer algorithm: The BPM Auto-Detection algorithm will continue to be improved in future Ots Studio versions. If you are processing Ots files that have already been processed by a newer algorithm than the one you are using, you can opt not to re-process the Ots file if a newer algorithm was used in the Ots file. 3. Click the Start Auto-Detection button to begin. Note: Depending on the size of your music library, and the speed of your computer, this process may take some time. Once the process has completed, you need to check your Ots files for correct BPM, and adjust as required. You will also need to set Match Point markers, Range Start and End markers, NPI values, and set each range as Active.